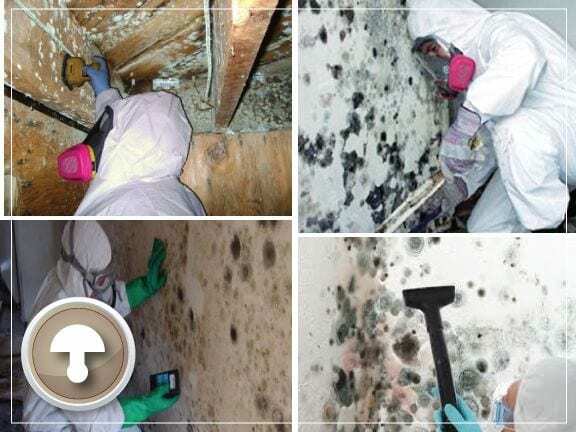 Looking for immediate mold removal services in Middletown, Maryland? RestoreUnow offers a response time of less than an hour and is approved to work with all insurance companies. We also offer FREE mold inspections for Middletown homeowners. Contact us to get immediate Middletown mold remediation and removal in your home or keep reading to learn more about our mold and restoration services. There are many types of mold and they can affect you or your Middletown property in different ways. Some people are allergic to different types of mold, which can cause some serious health issues. Some types of mold digest organic compounds more quickly than others, which means they can cause damage more rapidly. Just as mold can affect you and your property differently, it is important for us to know exactly what type of mold we’re dealing with so that we can properly remediate it. We follow specific procedures when removing mold from your home. The first thing we have to figure out is what has caused the mold to form. For mold to grow, it needs two simple things: moisture and a food source, which can be anything that is organic. Food, paper, drywall, and wood are organic food sources for mold. Our goal is to not only properly remove the mold but to find out why and stop that from happening in the future. We may need to do mold testing to ensure we know what type of mold we’re dealing with. We collect the samples and send them out to a third-party testing lab for analysis. To keep mold spores from spreading, we’ll contain the area and place it under negative pressure with our powerful air filtration devices. This step is critical, so that as we’re working and disturbing any mold spores, they cannot affect other areas of your property. It also helps to keep any mess down to a minimum for easier clean-up. When we’re in your Middletown home, we remove all of the materials that have mold on them, all the way down to the walls studs and sub floor if needed. When these materials are removed, we bag them, seal the bags, and dispose of them properly. Depending on the amount of material affected by the mold, we may need to utilize a dumpster to dispose of the material. After the materials have been removed, we have to clean any exposed material left. This can include walls, ceilings, furniture, and other items in the contained area. We use antimicrobials, biocides for mold, and HEPA vacuums in this process. Any exposed wall studs or sub floor are sealed with a mold inhibiting product to ensure mold growth won’t return. Our Middletown-based mold cleaning process is very thorough and may include cleaning wall surfaces and ceiling multiple times. Once the area is clean and safe, we’ll perform a final inspection for mold. During this inspection, we may also collect samples to send to our third-party mold testing company for final analysis to ensure the air and all surfaces are within healthy limits. From mold remediation and removal to mold inspection and testing, our Middletown emergency restoration experts can handle it all and ensure that your home is once again safe for you and your family. Call now or contact us online to request service. We offer 24/7 emergency mold removal services and offer a one-hour window where we’ll head out to your property.